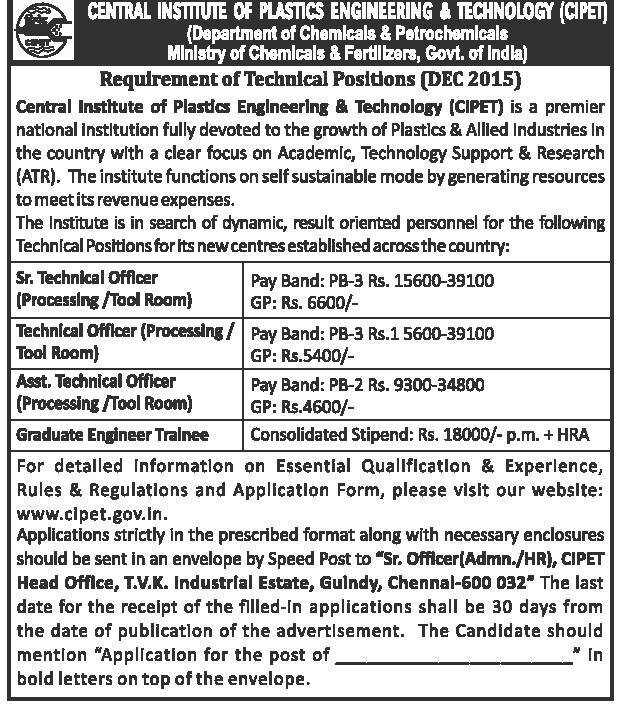 Under Department of Chemicals & Petrochemicals Ministry of Chemicals & Fertilizers,Govt. of India. Pay Scale-Pay Band-3 Rs.15600-39100 GP: Rs.6600/-.Age-Not more than 35 years. Pay Scale-Pay Band-3 Rs.15600-39100 GP: Rs.5400/-.Age-Not more than 30 years. Pay Scale-Pay Band-2 Rs.9300-34800 GP: Rs.4600/-.Age-Not more than 28 years. Age-Not more than 28 years. Apply on prescribed format along with necessary enclosures should be sent in an envelope by Speed Post to “Senior Officer(Admn./HR), CIPET Head Office, T.V.K. Industrial Estate, Guindy, Chennai-600 032”. Last date_The last date of application is 29.01.2016. Write on the top of envelope-“Application for the post of _______ in bold letters. Candidates who have applied against earlier advertisements published in 2015 for the post of Deputy Director (Technical) need not apply again.